On August 23-25, 2016, ETT held its first organizing-focused Summer Institute at the Nottawasaga Inn. Over three days, more than 40 ETT members worked with experienced organizers from Labor Notes to build and develop their organizing and leadership skills, while fostering union involvement. The institute is a first step in our organizing campaign to promote our members’ rights and to fight for the strongest public education system possible. 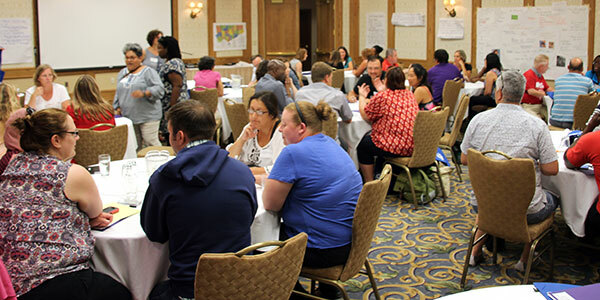 Starting in September, member-organizers trained at the Summer Institute will begin the process of having face-to-face conversations with their colleagues. These conversations will focus on what Toronto teachers want to see happening in the next round of bargaining and organizing ETT members to build a strong and effective union workplace. We’re building a movement for high member participation so that we can effect change within our schools and win what we and our students need in our next round of bargaining. See the photos from the Summer Institute on Facebook or Flickr.